A twinkle twinkle little star birthday party is the perfect way to celebrate in style. From the sparkly decoration, to the beautiful desserts, this is the kind of party that will make everyone smile. “Twinkle twinkle little star, I’ve grown so much and come so far”. What an absolutely beautiful way to celebrate! Appeningz Events submitted this absolutely adorable twinkle twinkle little star birthday party for us to enjoy. There is no denying that the first birthday is special. It’s special for the child, but it’s extra special for the parents. This is the birthday that parent’s can celebrate actually getting through the first year of parenthood. With a huge number of party themes to choose from, there are a lot of options for a first birthday. It’s not like you even have a feedback from your one year old, so really you can pick any theme that YOU like. If this is something that you are struggling with, then a twinkle twinkle little star birthday party is certainly not one that you can go wrong with. It’s suitable for both boys and girls and, it’s definitely one that will delight. Atira’s mom wanted a twinkle twinkle little star birthday party to celebrate the very important first birthday. Atira means “star”, so it seemed like the perfect theme. One of Aira’s favorite songs, also happened to be “Twinkle Twinkle Little Star”. The theme was clearly sold. Mom did a great job of picking the theme, because this is simply the most divine party that could have been organised for a first birthday. In terms of organizing the party decor, it is a sweet and simple concept to follow. Place stars everywhere and the result is perfect. This is the type of party that you can enjoy whether you are turning 1 or 100. The party decor is bright and bold at the same time as being magical and calming. It contains sparkling elements of pink and gold with a gorgeous sparkly tablecloth which immediately catches the eye. In pride of place on a separate table stood a birthday sign. The sign was filled with lots of little details about Atira. Not only did it look adorable, but it would have been lovely for guests to read. It also then makes the perfect treasured feature for Atira’s bedroom after the party. Atira’s name is laid out beautifully on the table, and the lights provide a wonderful focal point. The gold glitter stars are perfect for finishing off the look and linking in with the rest of the theme. Even the number 1 was covered in gold glitter providing a beautiful statement piece. The birthday cake tends to be a focal feature at parties, and this cake was no exception. It was absolutely stunning. The cake was a combination of pale pink, dark pink and light green and further softened by being ruffled in fluffy, shiny icing. You may think that you need to have a fancy table display to create something special, but simplicity is the key. To bring a party table to life, keep it simple and it will work every time. In the case of this twinkle twinkle little star birthday party, the simple display was created with mouth watering desserts. For an elegant looking dessert, macaroons work beautifully, and once again these incorporated the colors of pink and gold. 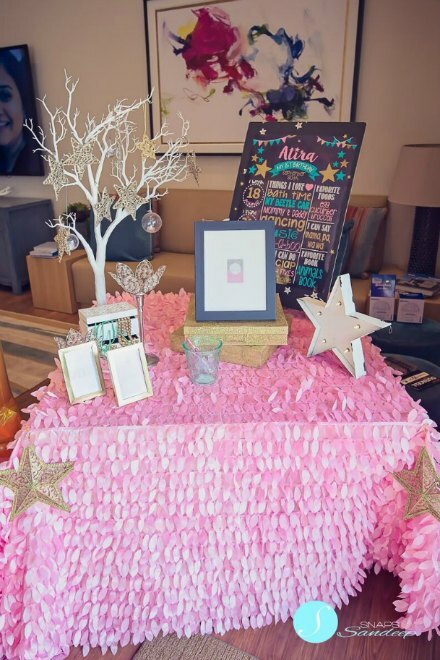 A photo board was set up on a separate table displaying photo’s from the first year of Atira’s life. It is a simple, but effective display, and once again the follow through of the star detail really brings this table to life. It is simple, sweet and inviting. Beautiful ribbons and sparkles of twinkle twinkle little star adorned the goody and favor bags. They matched the whole theme perfectly. If you are struggling for a theme for your daughter’s first birthday, you really can’t go wrong with a twinkle twinkle little star birthday party. This theme will leave you with fond memories of your babies first birthday, and it is one that everyone can enjoy. With some simple decorations, the party will be absolutely mesmerizing. What an adorable party for the beautiful Atira. Thanks again to Appeningz Events for sharing it with us. Love the Twinkle Twinkle little star birthday party? Sign up to the newsletter so that you never miss a thing!